My first thought upon finding leeks and cabbage in my weekly CSA farm share was "Ughhhh," since I'd never had leeks, but assumed I would hate them. And, I mean, c'mon. Does anybody ever really like cabbage? Might as well use them up together, right? So I chopped them up with some potatoes and made little fried latke-type veggie cakes! To con the kid into trying them, I called them "Birds Nests." And you know what? They were amazing! The leeks are kind of onion-y, but not as strong, so added a nice flavor complement to the potatoes and cabbage. They're fairly time intensive though, at 24 latkes per batch, and 8+ minutes cooking time per 3-5 latkes. Blarg. But boy are they worth it! They're far yummier fresh out of the pan, but with enough salt and possibly ketchup, also yummy at room temp or slightly chilled in a lunch! 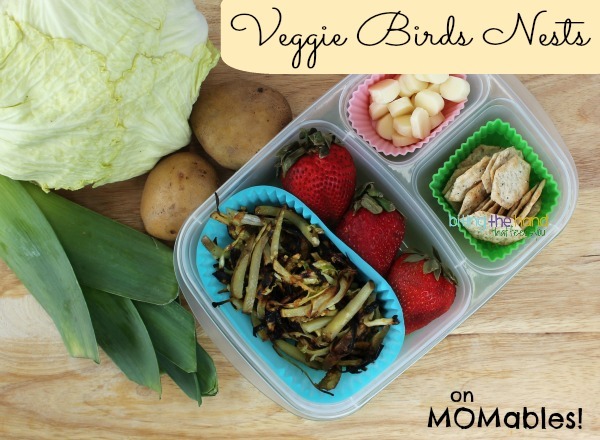 You can check out my Veggie Birds Nests recipe on the MOMables blog! Wednesday, 5/29/13 - This lunch was for Mama, since I could barely get the older one to eat these warm, slathered in ketchup and mustard. She hates anything I make though, unless it's pizza or macaroni. From a box. Baby liked them though. The strands were easy for her to grab and eat one by one. These don't hold up well as leftovers, so be prepared to have a pile of yummy shreds instead. Yum.. the 'bird nest' recipe looks great! We love leeks in soup! We love leeks! 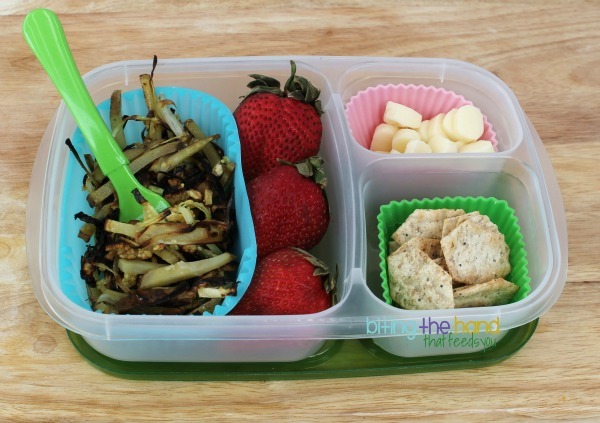 This lunch is beautiful, and I can't wait to try your bird nest recipe!